152 mm/57 МK-43 х 2 pcs. 180 Degree Turn Time25.71 sec. 100 mm/70 SM-5-1s4 х 2 pcs. 37 mm 61 shì8 х 2 pcs. 20 mm Oerlikon Mk48 х 1 pcs. Huanghe — Pan-Asian premium Tier VI cruiser. A British light cruiser (HMS Aurora) intended to carry out close reconnaissance and counter-destroyer missions. In 1948, the ship was transferred to the Republic of China (Taiwan) but defected to the People's Liberation Army Navy (PLAN) a year later, becoming its most powerful combat unit. In the early 1950s, a plan was drawn up for the refurbishment of the cruiser by replacing her weapons and equipment with Soviet-made models. Huanghe was first released for sale worldwide on 30 November 2017. Huanghe is very much comparable to another Tier VI cruiser with a similar Smoke Generator ( ) consumable: HMAS Perth. However, there are some very key differences between the two. Huanghe only has three turrets to Perth’s four, but gains better shell characteristics, 0.4 kilometers more main battery range, and a faster main battery reload (by half a second). 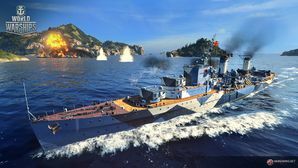 Playing Huanghe should be familiar to Perth veterans, as they both have the same creeping smoke screen thanks to a unique Smoke Generator ( ) consumable that operates on a principle different from that found on other ships. While other smokes have a relatively short activation time when laying down the screen itself, the Huanghe’s smoke activation timer lasts for 90 seconds. However, each 'puff' of smoke only lasts for 10 seconds, dissipating soon after having been lain. When moving at less than 12.5 knots, it is possible to stay hidden in the smoke even while creeping in one direction or another. It should also be noted that Huanghe has the lowest detection of any Tier VI cruiser, and is the only one with a sub-10.0 km base detection range currently. Having this is good news for the ship, as she needs all the advantages afforded by this low detectability and the unique smoke. This is because she also has the lowest health pool for cruisers at the tier, an "honor" previously afforded to Nürnberg. With only six guns total, she is also somewhat under-gunned for her tier, and she even has one less torpedo per broadside than Perth (with only three in each mount compared to Perth’s four). These three torpedoes also do less individual damage than Perth’s, though they do reload faster. Huanghe also gets a choice between mounting the Hydroacoustic Search ( ) and Torpedo Reload Booster ( ) consumables, making her the first non-destroyer class ship to gain access to the latter. Can mount both Hydroacoustic Search ( ) and Smoke Generator ( ) simultaneously. Additionally, Torpedo Reload Booster ( ) can be taken in place of Hydroacoustic Search. The Smoke Generator ( ) consumable functions similarly to that on Perth. This allows the ship to move at low speeds while remaining concealed within a smoke cloud. Her quick rudder shift time combined with her small turning circle allow her to dodge long range fire easier than most cruisers. Good mid-range torpedoes with wide firing angles. Anti-aircraft armament is strong for her tier. Lowest surface and air detection ranges of all Tier VI cruisers. Has the lowest amount of hit points of all Tier VI cruisers. The ship is lightly armored and often takes high damage from enemy armor piercing shells. Guns have a shorter firing range than most other cruisers at her tier. Firepower feels lacking due to the ship having few, small guns. As a premium ship, Huanghe doesn't have any upgrades to research. Upgrade Slot 2 provides three standard upgrade options. Of these, Damage Control System Modification 1 is generally viable. This slot also allows players to mount Hydroacoustic Search Modification 1 ( ), a special modification which increases the action time of the Hydroacoustic Search ( ) consumable. Upgrade Slot 3 provides Huanghe with the ability to specialize in certain roles. AA Guns Modification 1 is the best choice for players wishing to specialize in anti-aircraft duties. Aiming Systems Modification 1 ( ) is a generally viable choice which reduces the dispersion of main battery shells, increases torpedo traverse speed, and slightly improves the range and dispersion of the secondary battery. Players considering alternative builds may choose to equip Secondary Battery Modification 2 ( ) to increase the ship's firepower in close-quarter engagements. This slot also allows players to mount Smoke Generator Modification 1 ( ), a special upgrade which increases the action time of the Smoke Generator ( ) consumable. This upgrade is extremely useful and is highly recommended. As Huanghe's Smoke Generator ( ) is the same as Perth's in terms of performance, it is highly recommended to mount the premium version. Torpedo Reload Booster ( ) is not recommended due to the lack of torpedoes the ship has, thus leaving Hydroacoustic Search ( ) as the only preferable option for Slot 2. As a premium ship, Huanghe comes included with Type 10 camouflage that lowers her detection radius, reduces the accuracy of incoming shells, and increases the amount of experience she earns. As a Tier VI cruiser, Huanghe can quickly spew out fire like most other Tier VI cruisers. To boost the effectiveness of her firepower, India X-Ray ( ) and Victor Lima ( ) are highly recommended in order to increase the fire chance of her shells. Sierra Mike ( ) will help Huanghe feel slightly more nimble while November Foxtrot ( ) will help get her consumables off cooldown faster. As Huanghe is a premium ship, various economic and special signal flags can be mounted to further boost the economic and experience gains of the ship. However, as a mid-tier premium Huanghe does not make as much profit compared to a higher tier premium, so the economic and special signal flags may be saved for a higher tiered ship. Huanghe leads a desparate torpedo charge on an enemy battleship. Huanghe may have perished, but she brought down the enemy battleship. Flag of Huanghe. Given to players who purchased a special bundle containing Huanghe. Huanghe is depicted with a fantasy Soviet refit. Historically the ship was sunk shortly after defecting to the Communists in 1949 and was never repaired. The empty hulk spent the remainder of its career in China as an accommodation and warehouse ship. By the time she received the name Huang He in 1959, she was being planned for conversion to a salvage ship. HMS Aurora. The neutrality stripes suggest this photo was taken between 1936 and 1939. Aurora in heavy seas, early 1940s. Aurora in contrast camouflage, 1941 or earlier. Aurora at anchor off Liverpool, April 1942. Aurora, undated, likely 1943 or later. Aurora (now Chungking) being raised after having been sunk in service to her new navy, 1949. This page has been accessed 59,574 times.